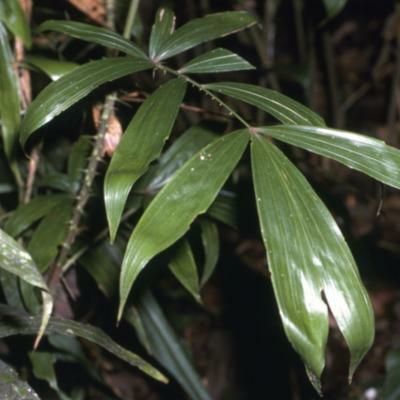 This species is accepted, and its native range is S. Myanmar to Jawa and Philippines (Palawan). Widespread throughout the State. Elsewhere throughout Borneo, Java, Sumatra, Peninsular Malaysia, S. Thailand and Palawan. 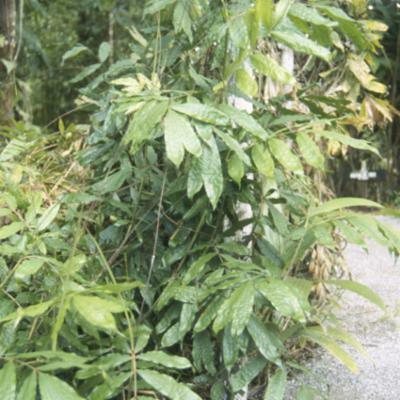 Extremely variable slender to very slender clustering rattan forming low thickets or climbing to 10 m or more; stem without sheaths 2-6 mm diam., with to 10 mm diam., internodes to 30 cm long, usually less. 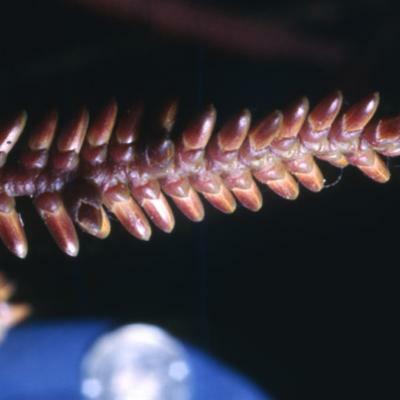 Sheaths bright green when fresh, frequently reddish tinged, somewhat striate, unarmed or sparsely to densely armed with horizontal spines to 5 mm; knee present; ocrea moderately conspicuous, to 10 mm, deep crimson when young, tattering with age. Flagellum to 1 m. Leaf ecirrate, very variable in form, in adult leaves always with the terminal pair of leaflets joined together for much of their length; petiole usually absent, rarely to 5 cm in some montane forms; leaflets 4-10 on each side of the rachis, grouped or more rarely subregular, lanceolate to spathulate, the lowermost 1-2 pairs often swept back across the stem, longest leaflets to 20 × 5 cm but usually much less, transverse veinlets conspicuous; young leaves tinged pink. Male and female inflorescences superficially similar with 2-5 partial inflorescences bearingcrimson rachillae ± at right angles. Ripe fruit ovoid, c. 12 × 8 mm, with a short beak and covered in 15-21 vertical rows of pale greenish white scales. Seed somewhat angular; endosperm homogeneous. Seedling leaf with 4 broad shiny leaflets. (Fig. 57). Slender clustering rattan climbing to 15 m; stem without sheaths 2-4 mm diam., with sheaths to 5 mm diam., internodes to 12 cm long, usually less. Sheath dull brownish-green, reddish- tinged when young, unarmed but bearing rather regularly arranged low ridges, the sheath thus appearing corrugated', knee present; ocrea very short. Flagellum to c. 40 cm. 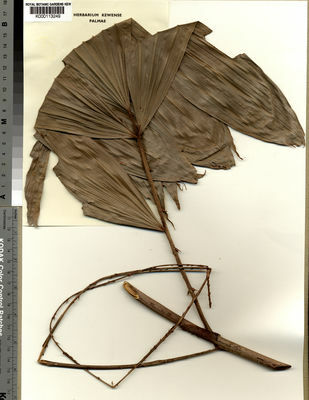 Leaf ecirrate, to 35 cm long, but usually much shorter;petiole absent', rachis bearing rusty-red hairs; leaflets 4-8 on each side of the rachis, broadly lanceolate, acute or acuminate, usually strictly opposite, the basal 1 or 2 on each side smaller than the rest and swept back across the stem, the apical pair joined together for over half their length, the mid leaf leaflets to 13 x 2.5 cm, usually much less, transverse veinlets quite conspicuous; young leaf pinkish-tinged. 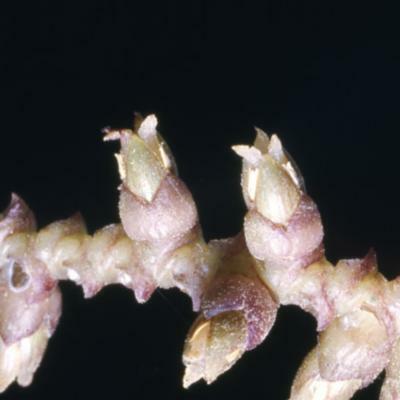 Inflorescence without a terminal flagellum, to c. 90 cm, only the female known; partial inflorescences 2-3, borne towards the tip of the inflorescence; rachillae 3 - 5 cm long. Mature fruit ovoid, 10 x 7 mm, tipped with a conspicuous cylindrical beak to 2.5 mm; scales pale yellowish-brown, arranged in 14 vertical rows. Seed c. 8 x 4 mm, irregularly scalloped and faceted. Seedling leaf not known (Fig. 77). Known from a few collections from the 1st Division (G Pueh, G Matang, Bako, Sabal Tapang, Semengoh) and one collection from the Hose Mountains. Not known elsewhere. Endemic. 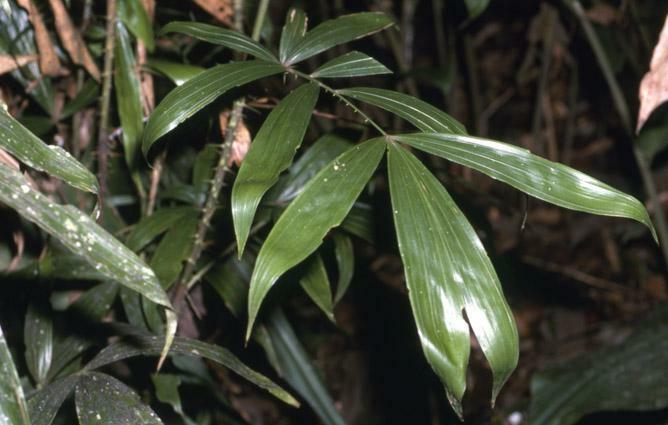 Widespread throughout the State, but particularly abundant in the Tenom and Keningau districts. Endemic to Sabah. Habit - Climbing; not branching in the forest canopy; not dying after flowering. Plants dioecious. 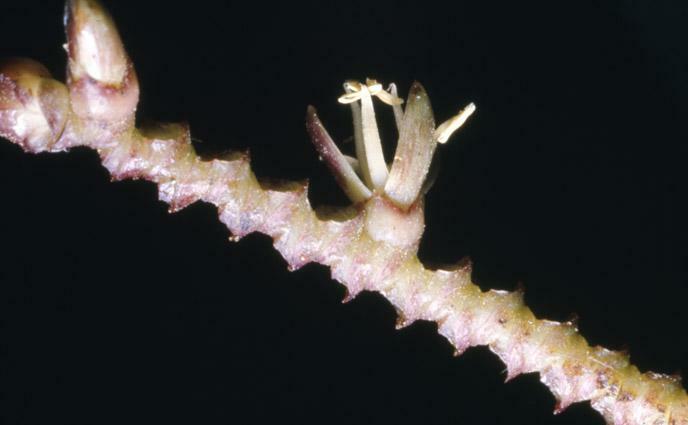 Leaf-sheath - Tubular for most of its length; stem and sheath together 0.5-0.6 mm; flagellum long; knee present; with spines similar to the rest of the sheath. Sheath surface lacking small horizontal ridges; without hairs or minute spines; with scales on surface; grey. 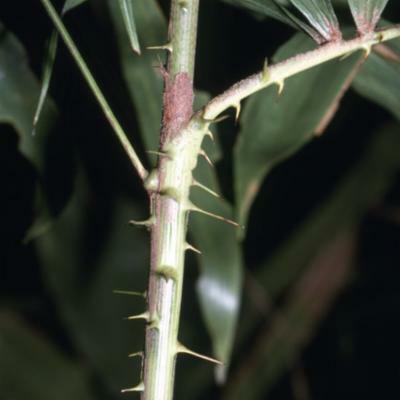 Leaf sheath without spines, or with sparse spines; spines persistent; upward pointing; of more or less the same size; the larger spines tapered; the longest, excluding those at the mouth of the sheath less than 1cm. Spines straight. Spines mostly not grouped. Spines around the leaf sheath mouth far fewer than on the rest of the sheath. Ocrea - Present; not diverging at an angle from the stem; tattering; unarmed. 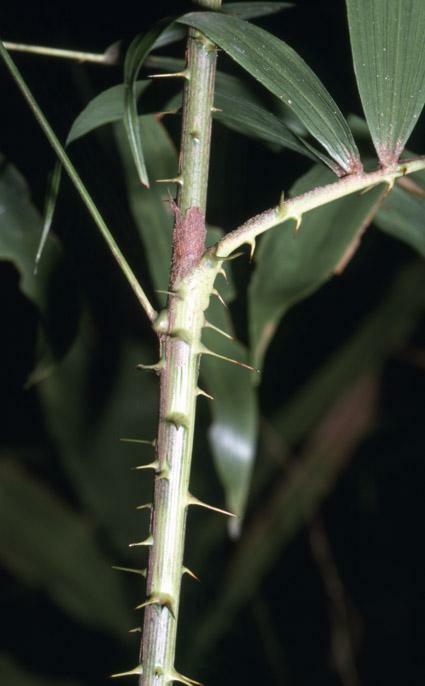 Leaf-stalk - Present, usually greater than 3cm; armed; irregularly; spines present in channel on upper face of petiole. Large well-defined auricles absent; blotches on petiole absent. 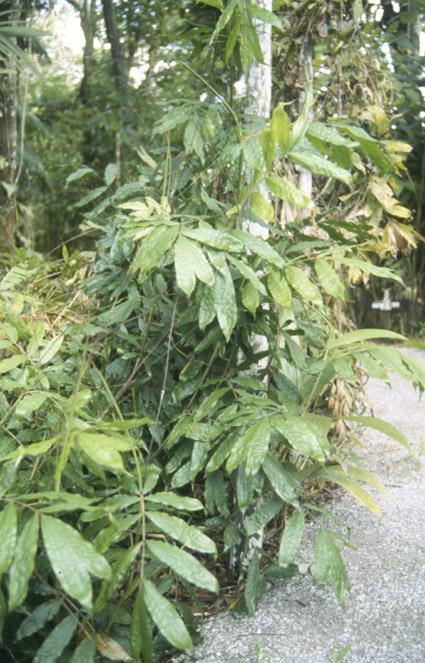 Leaves - Ecirrate; rachis armed; not hairy. Scales absent from leaflet surfaces. Leaflets sessile; 1 to 10 on each side of rachis; irregularly spaced and parallel; held in a single plane; spathulate; the leaflet tip cucullate (hooded). Longest leaflet 7-18 cm; 2 to 5cm wide; with none or very few bristles; the margins with no or very few bristles. Leaflets scarcely plicate; the veins not radiating; midrib not raised and prominent. Lowermost leaflets not reflexed across the stem. Apical leaflets joined to 2/3; not less than 4 cm long. 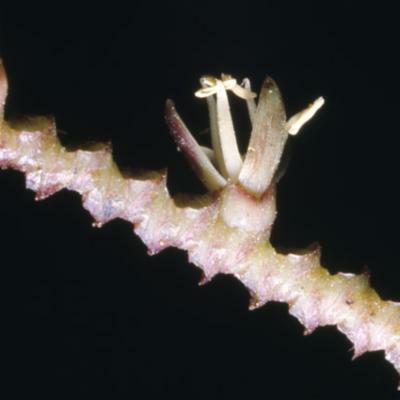 Inflorescence - Inflorescence axis erect along the axis, with clawed spines on the primary bracts; not rooting at its tip; much longer than the leaves; the first bract not enclosing the inflorescences at anthesis. 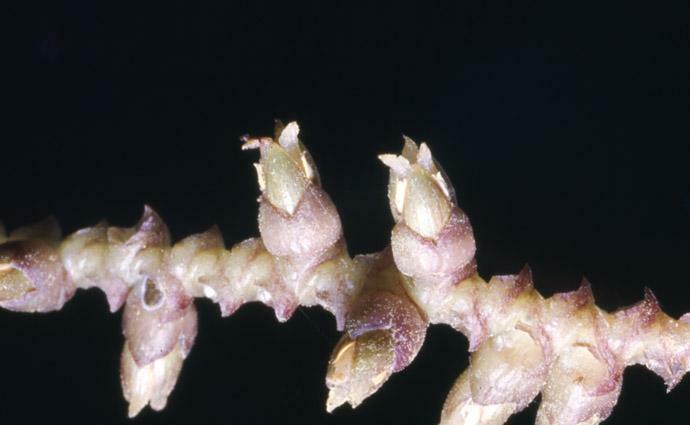 Partial inflorescence present; bracts at the base of the partial inflorescences wholly tubular with a neat mouth or a small open limb, much shorter than the partial inflorescence. Rachilla lacking an enclosing bract; not at all pressed against the subtending bract. Flowers arranged in two rows. Male rachillae not less than 1 cm long. Bracts on the rachillae not net-like. A poorly known species found in western Kalimantan. In Sarawak known only from Semengoh. 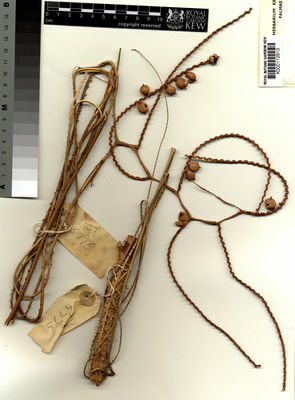 Elsewhere known only from the type, collected last century by Teysmann in Kalimantan. Endemic to Borneo. Very slender clustering rattan climbing to 3 m only; stem without sheaths 3 -4 mm diam., with sheaths to 6 mm diam., internodes c. 12 cm long. Sheaths dull greenish-brown, unarmed; knee present, rather small; ocrea short, tubular, ± truncate, membranous. Flagellum to 30 cm. 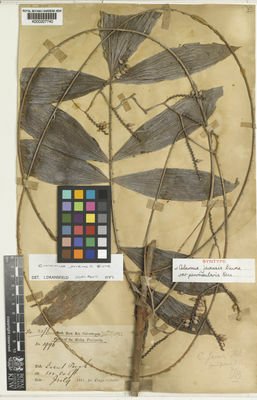 Leaf ecirrate to 40 cm; petiole very short or absent; rachis covered in dark brown hairs; leaflets c. 7 on each side of the rachis, rather broad lanceolate with 3 conspicuous veins, the terminal leaflet pair joined for about 21 3 their length, the others ± regular, alternate, the mid leaflets c. 14 x 2.5 cm, the basalmost much shorter and swept back across the stem, all leaflet surfaces densely covered by soft pale hairs, the margins appearing ciliate. Other parts not known (Fig. 76). With certainty known only from Nabawan; a sterile specimen from Sapa Payau F.R. is probably this species. Endemic. Confined to the lowlands of the eastern part of Sabah; endemic. Slender to moderate clustering rattan climbing to 20 m; stem without sheaths to 10 mm diam., with sheaths to 13 mm or more diam., internodes to 25 cm long. Sheaths dull green with scattered deciduous brown scales, unarmed or, more usually, rather densely armed with horizontal pale green spines 5-18 mm long with hairy margins when young; knee conspicuous; ocrea to 10 mm. Flagellum to 2 m. Leaf ecirrate, to 65 cm; petiole absent; leaflets sub-regular to regular, to 10 on each side of the rachis, broad, spathulate, undulate and often bullate, very conspicuously 3-nerved, the lowermost 2 leaflets on each side swept back across the stem; mid leaf leaflets to 24 × 7 cm, apical pair joined for c. 2/3 their length; young leaves tinged pink. Inflorescences to 2 m long with 6 or more partial inflorescences in the male, c. 3 in the female; rachillae 12-22 cm long, rather distant, bright crimson, bearing rather distant flowers. 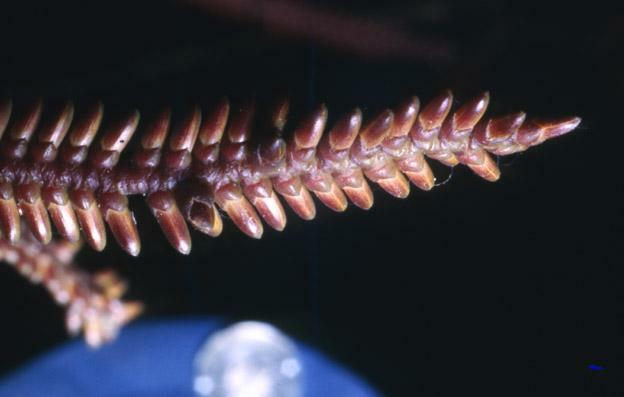 Mature fruit rounded, c. 9 mm diam., with a beak to 1 × 1 mm and covered in 21 vertical rows of narrowly pointed ivorycoloured scales with dark brown tips and margins. Seed c. 6 × 5 × 4 mm, with shallow depressions; endosperm homogeneous. 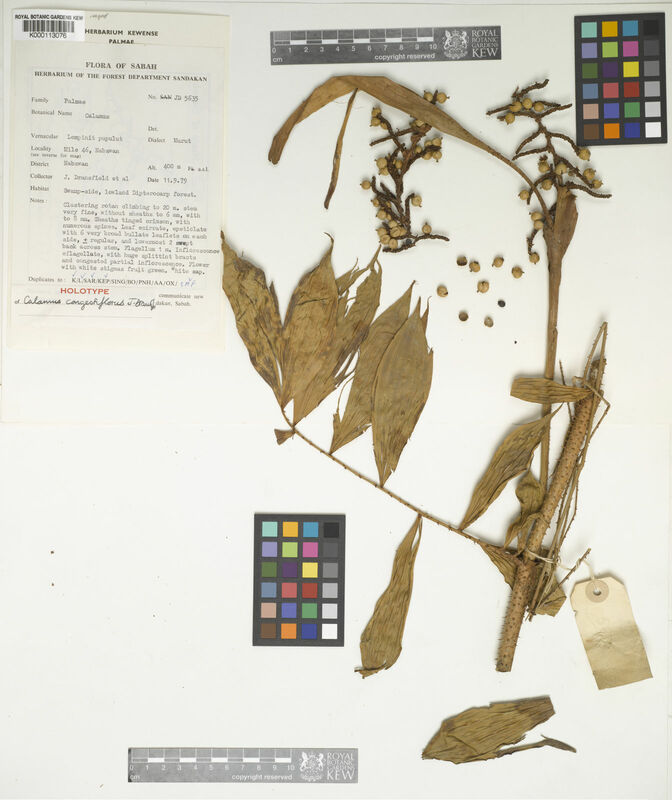 Seedling leaf with 4 broad leaflets. (Fig. 58). Known from a few collections. Elsewhere in Sarawak and Sabah, possibly also in Sumatra. Produces an excellent cane for binding, to make fish traps and carrying baskets. The cane appears to be of excellent quality. Widespread local use as twine, perhaps receiving a rudimentary cultivation near villages. None known. This could be a very desirable ornamental. Not known: probably with qualities similar to those of C. javensis.